Amani will live at the Philadelphia Zoo's PECO Primate Reserve. A little bit of guerilla marketing went a long way for the baby gorilla born in late August at the Philadelphia Zoo. After a monthlong public contest to name the baby female, the zoo announced on Monday that the adorable ape will be called Amani, a translation of the Swahili word for "peace" used in the Democratic Republic of Congo. The Philadelphia Zoo partnered with the DRC-based Gorilla Rehabilitation and Conservation Education (GRACE) to promote the contest, which called for a $1 minimum donation from voters to support the organization's gorilla care and conservation efforts. 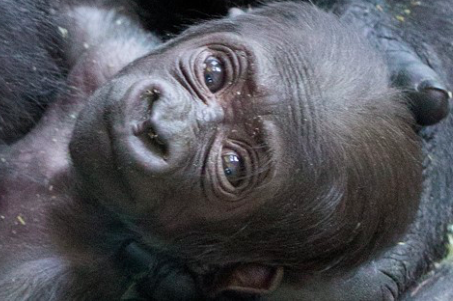 Names were picked from a list of orphaned gorillas who currently live at GRACE's sanctuary. A total of $6,600 donated by voters was matched by the Philadelphia Zoo, which will provide GRACE with $13,200 to protect the highly endangered Grauer’s gorillas who are targeted by poachers in the DRC's eastern lowlands. Amani, the daughter of a 21-year-old female named Honi and the 31-year-old male named Motuba, will be housed at the Philadelphia zoo's PECO primate reserve.